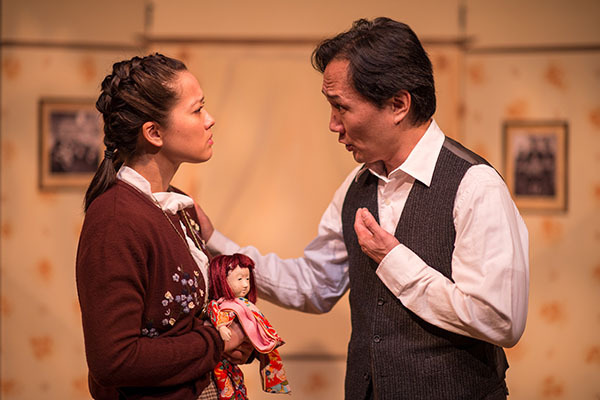 Kogawa’s book, turned children’s opera, Naomi’s Road, will be directed for the first time by a Japanese Canadian in its Toronto debut. Soprano Hiather Darnel-Kadonaga stars as 9-year-old Naomi, in Tapestry Opera’s premiere of Naomi’s Road. Photo courtesy Dahlia Katz. TORONTO – While Tapestry Opera’s artistic director, Michael Mori, was completing his masters at UBC, he was the understudy for a contemporary opera production with the Vancouver Opera. The opera was an adaptation of Joy Kogawa’s book, Naomi’s Road, of the same name. It seems fitting now that Kogawa approached Mori about a year ago, asking him if he was interested in directing the Toronto production of the show. Mori says he decided to produce Naomi’s Road with Tapestry Opera because of the passion with which Kogawa spoke about the opera. She felt it was imperative to tell this story now, as the Nisei get older, and to share it with their families. 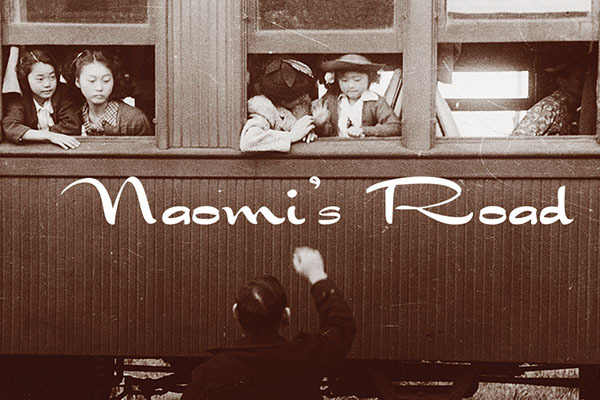 Naomi’s Road is making its Toronto debut this month. There will be two free/by donation performances for the Japanese Canadian community, first on Nov. 14 at the Japanese Canadian Cultural Centre and Nov. 15 at St. David’s Anglican Church. 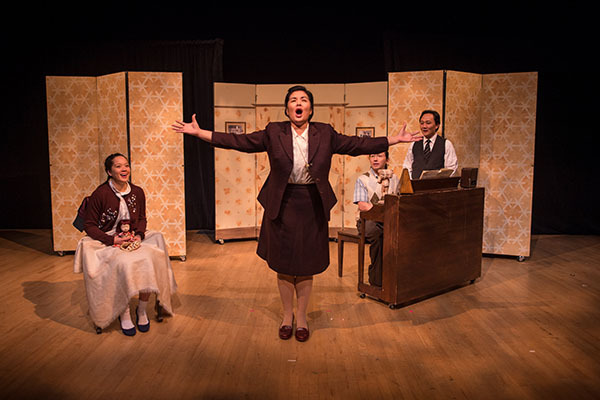 The opera tells the story of Japanese Canadian internment through the eyes of a young girl named Naomi. Her story begins like any other little girl, with a home and family. Then she is forced to pack her life up into one suitcase and leave her home, and is separated from her parents. 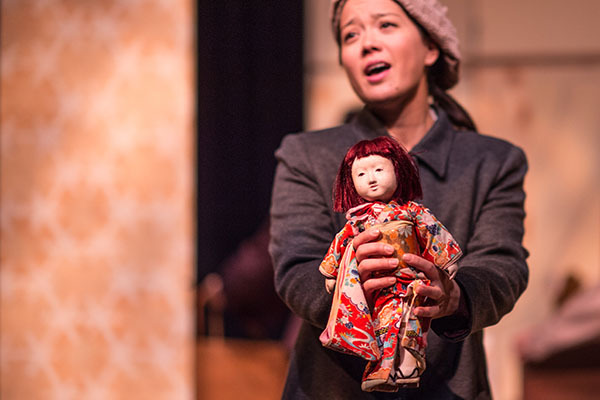 “We see this journey where she has a beautiful home in the beginning and all that’s left of that is one suitcase, and as a child she is living as a criminal,” says Mori, who will be the first Japanese Canadian to direct the opera. Hiather Darnel-Kadonaga as Naomi and Sung Taek Chung who plays Daddy, Bully, Rough Lock Bill and Trainmaster. Photo courtesy Dahlia Katz. In telling the story through the voice of a child, it becomes in ways an adventure story, says Mori. Naomi faces and overcomes obstacles and trials, and as a child, finds the positive way out in order to find happiness. He says he hopes children can learn about Japanese Canadian internment from Naomi. For children, it can be a relatable piece, where they can see a story of resilience and redemption, and learn that no matter what life hits you with, you can come out the other side stronger. The opera was originally produced by the Vancouver Opera and toured throughout elementary schools in B.C. and parts of Alberta in 2012 to 2013. In cities like Smithers, Hazelton, Kitimat, Nanaimo among others, the opera was performed for 30,000 schoolchildren, from kindergarten to grade 12. “I’m quite proud of Vancouver Opera for taking this bold direction, this story is not a children’s story, but a story that children and adults can enjoy,” says Mori. The libretto for Naomi’s Road was written in 2003 by Ann Hodges, who was also the stage director, and the score was completed by September of 2004 by Ramona Luengen. The opera was performed at the annual OPERA America performance in 2005 as well as a multicultural lecture in Vancouver. The opera was also broadcasted on the CBC Radio program, IDEAS, alongside a lecture by writer Roy Miki. Alongside the free performance, in Toronto, the opera will run from Nov. 16 to 20, at St. David’s Anglican Church, where St. Andrew’s Japanese parish, which is Kogawa’s church, congregates. Following the performances each night will be a reception, where Japanese Canadian authors, including Kogawa will read excerpts of their books, while manju and green tea is served. Mori says he hopes this is just the beginning of Naomi’s Road in Toronto. He says he hopes the opera will be picked up and performed at schools in and around Eastern Canada, the way it was in B.C., to teach school children about Japanese Canadian internment. For ticket and event information, visit Tapestry Opera’s website. Unfortunately there are no plans yet to bring the opera to Ottawa, but the director, Michael Mori, has said he hopes in the future Naomi’s Road will tour through Ontario like it did in B.C. years ago.